This moderate-size fantasy novel clocks in as the third book in Le Guin’s acclaimed Earthsea Cycle. It starts off some time after the ending of the second book, bringing us once again into a world plagued by troubling magical portents and an unstable political climate — a place where nothing is certain or safe. Magic is failing; nothing works as it should. Our favorite magician, Ged, now the land’s respected archmage, is faced with a series of immensely difficult questions: should he take it upon himself to find out why magic is going so wrong in his world? Should he enlist the help of others or go into danger alone? What really is the answer to his world’s problems? Out of turmoil and strife, an unlikely comrade emerges … the king’s son Arren, whose brisk temper might put not only his and Ged’s lives at risk, but perhaps even tip the balance of the world. Together, they embark on a risky journey to try to understand — and perhaps solve — the cause of magic’s failure. Regular readers might remember me as a diehard Earthsea fan. I typically love much of what Le Guin writes. That said, I actually found this book to be the most difficult of her novels to get through. The book opens in a manner that is not up to Le Guin’s usual writing standards — it begins jerkily and almost awkwardly, as if she were trying to deliberately nurse tender details and draw out the excitement … but in this way, doing it too much and too deliberately, kills the excitement that could’ve been in the first several chapters. The characters’ interactions with each other are stiff, and sometimes the characters’ own psyches are contradictory from teenage-y self-consciousness. To make the opening chapters worse, the action itself — the real, gutsy action, anyway — kicks off quite slowly. I put down the book many times at this stage, not sure if I would be able to sit through it if the rest continued on this way. The slow pace and the undelicate awkwardness were killing my ability to sink into the fantasy story. However, the story does begin to redeem itself nearly halfway through the novel. It’s as if Le Guin recovers her former style after brushing off world-shattering “suggestions” from an editor or reviewer. 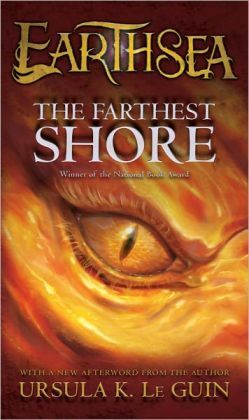 As Ged and Arren sail through the reaches, hunting down answers while racing against time, the reader begins to feel the sting of sea wind on their own skin, and Earthsea feels more like Earthsea again. The later chapters of the book contain enough action that they might be able to make up for the slowness of the beginning. We see Arren and Ged facing dangers that make the substantial dangers of the other books pale in comparison. (Can you imagine it?) Wizards addicted to a dangerous opiate; treacherous robbers; and finally, an evil worse than death itself. Le Guin managed to keep me on the edge of my seat enough during the final throes of the book that I was able to close it with a satisfied and terrified smile, looking forward to the next in the series. Particularly redeeming, the end contains in-depth philosophical messages woven into the story, which spur the reader to consider their own thoughts on life and death and the nature of these two institutions. Are they really as finite and as separable as they seem? While Le Guin often asks these questions of us, she delivers these questions particularly poignantly in the later half of this novel. These questions come perfectly timed with the story’s life-or-death battle scenes, each scene — laden with its own question — heavy as a black stone sliding into cool water. Between the roar of dragons, the spin of dark magic, or the splash of a dolphin in a foreign sea, the reader will remember them for a long time to come. All in all, I’d give this book 3 out of 5 stars. It is not as eloquent nor as stunning as Le Guin’s other Earthsea novels, but for those who enjoyed the other Earthsea books or who would like to digest a mind-probing and at times difficult read, this book might be a valued experience. Expect to be bored by the first chapters, but remember the redemption the later half and especially the ending have to offer. The conclusion is sharp and powerful enough it wraps up the loose ends generated by a clumsy beginning. A final note — if you love books with dragons, you might want to skip on over to the ending of this one. There are exquisite mentions of dragons, and the dragons here are nothing like those simpering ones you’ll find in Christopher Paolini’s Eragon or His Majesty’s Dragon by Naomi Novik. These dragons are the real, vicious, sharp-clawed things in the flesh, but with enough wisdom and dignity to make excellent impromptu allies for an archmage!